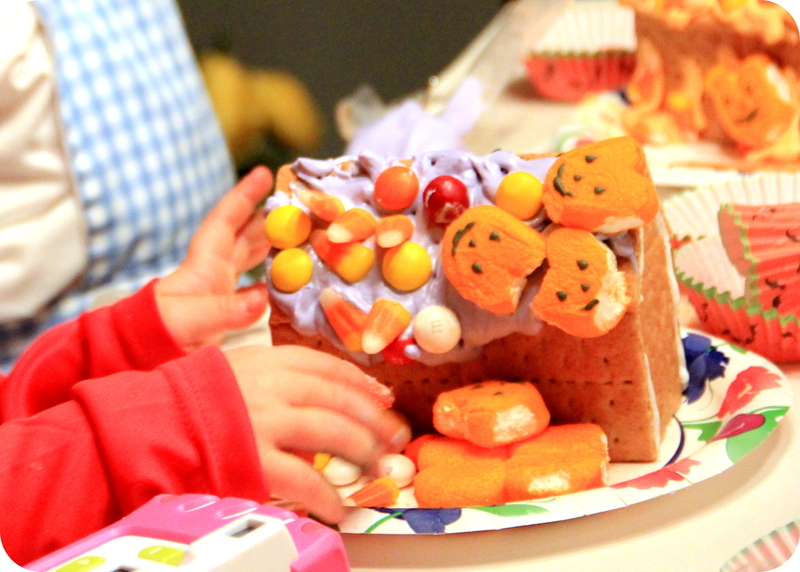 Never Fails… each time a holiday comes and goes, I get excited to do a gingerbread house with the kiddies…. however, I always forget to get excited until a day or two before the holiday and by then, it’s too late. This time was no different. We recently had a few halloween trick or treaters come over for some pizza fun and I needed an activity to do with them. Pumpkin and ghost cookie decorating seemed like a great idea until I realized it would probably hold their attention for no greater than 8 minutes. The next solution? 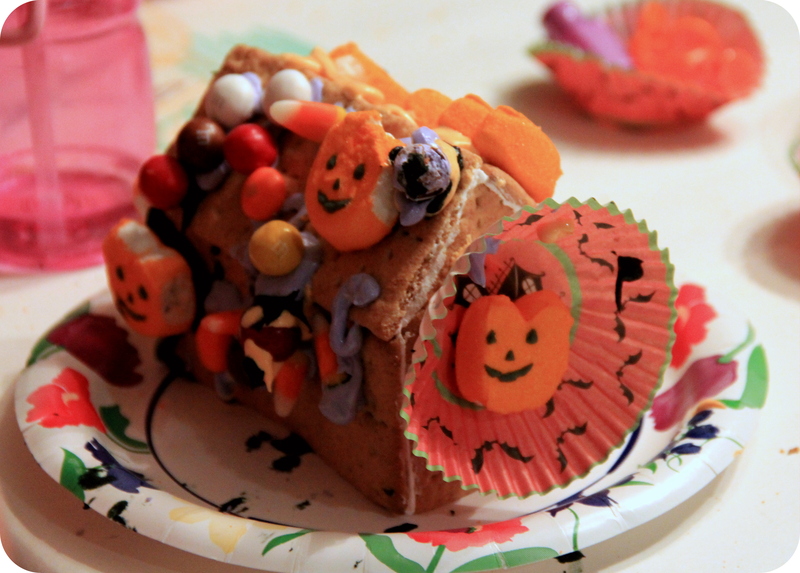 Haunted gingerbread houses! The problem? Less than 48 hours to go. I found this idea while “paging” through the internet and my project was underway. You could use these for anything… haunted houses, holiday houses, easter bunny houses, rainy day houses… anytime you need to keep the kiddies occupied for a little time, while ensuring you will be left with a nice project full of candy to pick at for the next few days. Prepare 2 end pieces per house. Lessons learned: First Attempt: One site said to use a very sharp knife. Result: This kept cracking the crackers. 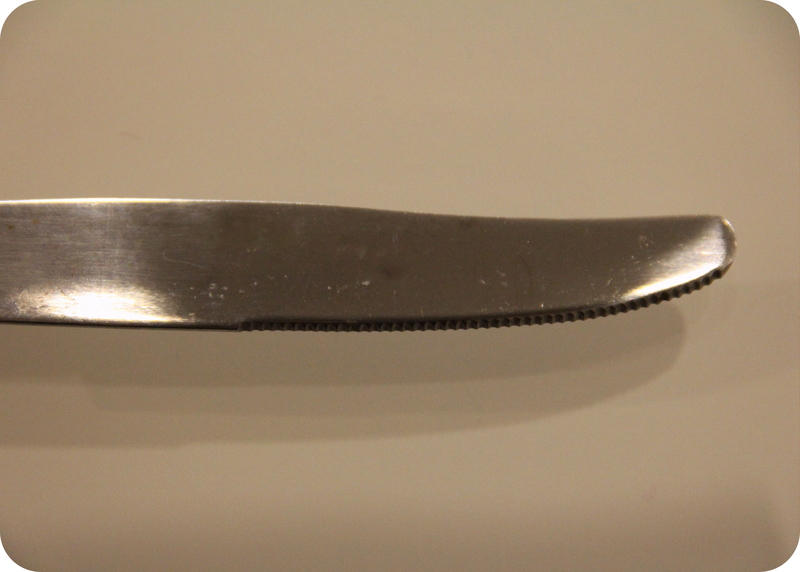 How to Resolve: Use a butter knife, or plastic knife, with a very small seratted edge. 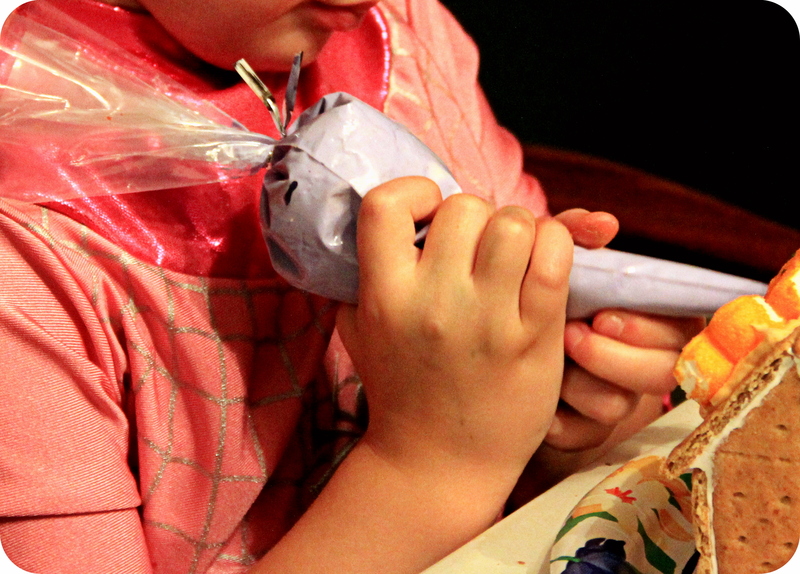 Then lightly “saw” the crackers until you work your way halfway through and gently snap. 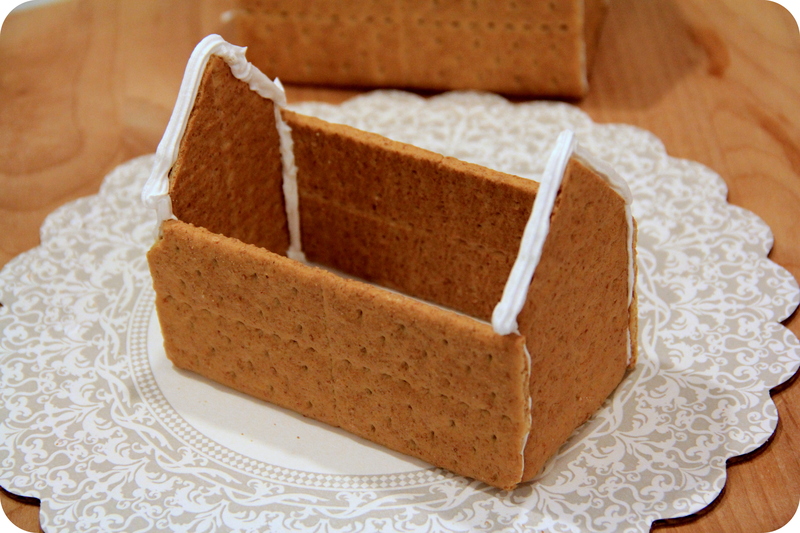 With a piping bag, or ziplock bag with the corner cut, pipe royal icing on the outside edges of the end pieces. Assemble the walls. Hold together, sing a quick song or two in your best “no one is listening voice” allowing the icing to set for a minute. Pipe the top edges and apply the roof pieces. Tape rolled paper to the table where these little houses will be decorated. I covered the dining room table and drew a little halloween pumpkin or ghost with crayon at each spot with each child’s name. Place assorted candy in small bowls or holiday decorated cupcake wrappers all over the table for easy access while they build. Each child got a small piping bag of royal icing. These were a great little project for the kiddies to work on. My age group were 3-4 year olds so most dug right into the house about 14 seconds after they considered them to be completed. Cover the houses with cling wrap until ready to use. 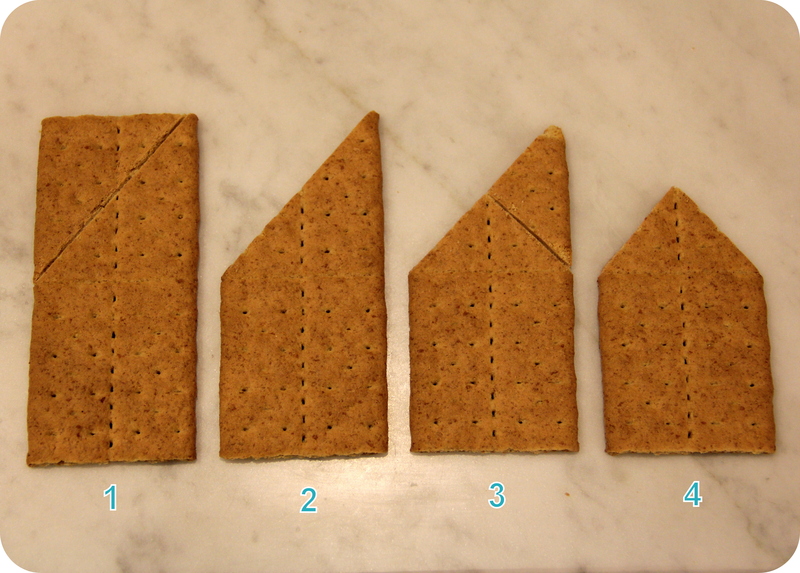 The graham crackers soften as they get stale. Our houses were a little soft and a few kids made extra large sky-lights in their rooftops. I can assure you, they didn’t mind a bit. 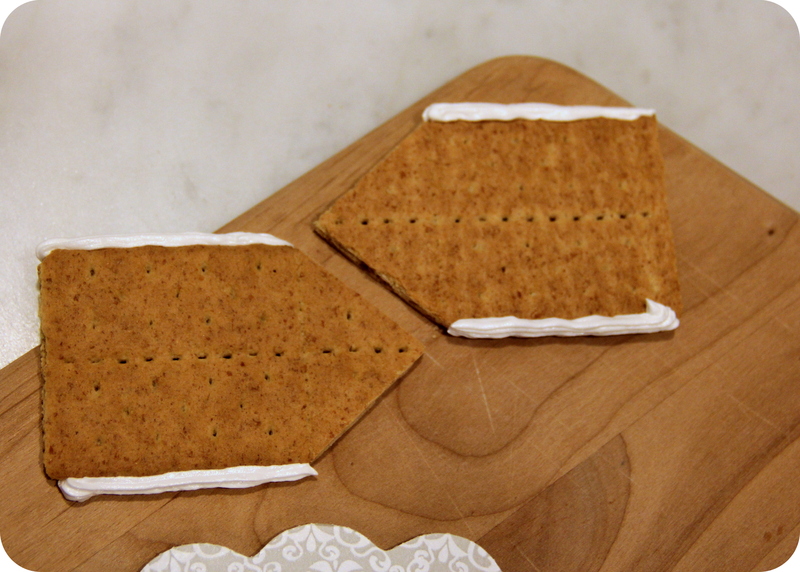 Put a dab of royal icing under each corner of the houses to help give them traction to the plates, boards or whatever you use as your base. This will prevent them from sliding all over the place. 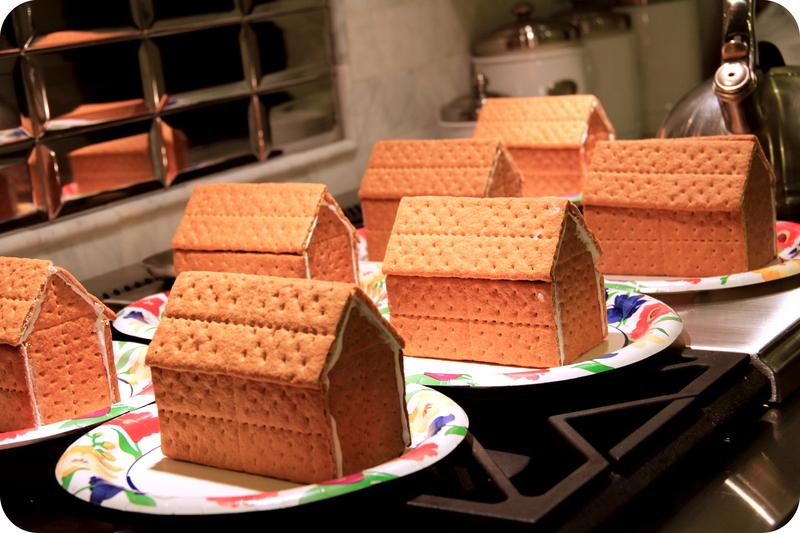 You can make the houses a bit smaller by using 1 section as the side walls, rather than an entire sheet of graham cracker. This will give you the eaves on the rooftops and a little more stability. Have fun… I had to hold myself back a few times to avoid telling my little one “how this and that should be done.” I decided this was her creation and she needed to feel confident with however she chose to complete her “castle.” Just them the explore and create as they would like… regardless, they will be so proud of their delicious creations and so will you!